Are you ready to ascend the virtual pyramid of riches on The 100,000 Pyramid Slot? Well, go straight to the top of your excitement with this enthralling slot game playable at Moon Games. 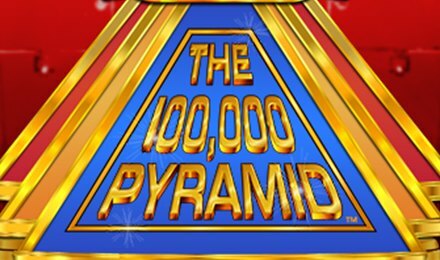 The 100,000 Pyramid Slot is a five-reel slot game by IGT. With its phenomenal features and exceptional symbols that might award huge wins, this game becomes one of a kind! Grab your mobile, tablet or desktop device to start climbing up the stairs towards the summit of the pyramid. Who knows, some incredible prizes might be at the top! How about starting your gameplay onto The 100,000 Pyramid Slot by logging onto your account at Moon Games? If you don’t have one, feel free to register for an account. This awesome slot game proposes an action-packed gameplay with adjustable stakes. Feel free to navigate through the Betting options to set the bets as per your convenience. Bet Levels: The 100,000 Pyramid Slot includes no Bet Levels throughout its gameplay. Amount of Paylines Selection: The game allows you to choose your desired pay lines. By accessing the Green button on the left side of the screen, you can change the number of lines currently active. From a minimum of 1 up to a maximum of 15 lines can be selected. Coin Values: The 100,000 Pyramid Slot offers you the option to adjust your Line bets as well. Access the same green button as above to set the bets. A minimum of 2.00 up to a maximum of 100.00 can be chosen. The 100,000 Pyramid Slot Logo is the Wild Symbol of the game. It can chip in any combination as any other symbol of the game. However, it cannot act as a substitution for Scatter Symbols. The Scatter Symbol is the special symbol with the words The Winner Circle on it. It is used to activate the Bonus Rounds of the game. Gather three or more Scatter Symbols to activate this dynamic feature. You will be granted 2 Free Spins, a multiplier starting at 1x and 5 picks on the Pyramid. You will have to start picking up prizes from the bottom of the pyramid. As you progress, you will accumulate bonus prizes, Free Spins, Multipliers or even extra picks. The feature ends when you are out of Picks. Once the Bonus Game is over, you will get to play your Free Spins. The Free Spins Round starts almost immediately. During the Free Spins Round, Scatters can award you up to 15x your total bet if you hit five of the kind. Good luck in climbing the great Pyramid of Cash of The 100,000 Pyramid Slot.